South Pacific/The King and I/Oklahoma! Trio of classic Rodgers and Hammerstein musicals. Based on the book 'Tales of the South Pacific' by James A Mitchener, 'South Pacific' (1958) sees an American Navy nurse (Mitzi Gaynor) stationed on a South Pacific Island falling love with a middle-aged French planter (Rossano Brazzi), who goes on to become a war hero. Includes the songs: 'There is Nothing Like a Dame'; 'Bali Ha'i'; 'Happy Talk'; and 'I'm Gonna Wash That Man Right Outa My Hair'. 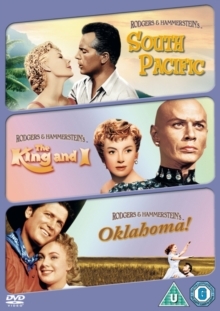 Based on the musical play 'Anna and the King of Siam' by Margaret Landon, 'The King and I' (1956) is the story of the nineteenth century English schoolteacher Anna Leonowens (Deborah Kerr) who is employed by the King of Siam (Yul Brynner) to educate his many children, and takes her son, Louis (Rex Thompson), along with her. Musical numbers include 'Hello Young Lovers' and 'Getting To Know You'. 'Oklahoma!' (1955) is set in sunny Oklahoma where farmhands Curly (Gordon McRae) and Will (Gene Nelson) fall for local girls Ado (Gloria Grahame) and Laurey (Shirley Jones). The path to true love is thwarted, however, by nasty farmhand Jud Fry (Rod Steiger). Features classic songs such as 'Oh, What a Beautiful Mornin' and 'People Will Say We're in Love'.